The founder of the free online editable encyclopedia Wikipedia has warned fake news and the challenges facing traditional journalism have the potential to undermine people's confidence in democracy. 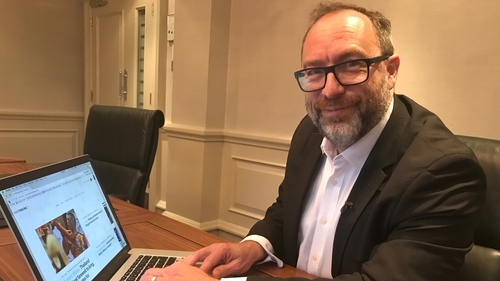 Speaking on a visit to Ireland today, Jimmy Wales said the problem of fake news is quite important, but so too is the broader issue of the ongoing difficulty in the business model of journalism, particularly local reporting. He said together the dual challenges mean the quality of information people are getting is really broad and this should not be forgotten. Speaking to RTÉ News, Mr Wales said: "When you have a massive reduction in the number of professional journalists in local media then local corruption...will follow that. "When you see local corruption ... then it undermines people's confidence in democracy as a system and it makes them more vulnerable to a strong leader who will drain the swamp." The Wikipedia founder is currently in the process of setting up a new web-based news service that he hopes will combat the problem of fake news and be sustainable thanks to the involvement of citizens and professional journalists. Ultimately to be funded by reader contributions, WikiTribune will launch with no ads and no paywall, he said, instead using readers to support fact checking and keeping the writing "honest and neutral". They will be able to contribute to the stories by editing and changing them, in much the same way as Wikipedia functions. "I don't believe that pure citizen journalism is the answer because you just run into too many problems," he explained. "Yet there is a lot you can bring to the table, and if you are restricted to simply sniping away from the comments at the bottom, well we know how that ends up, it is not very useful. "But if people are brought into the community to say ‘How can I help?’, what are the things that I can do with the background research, copy editing, whatever it might be, if we can reduce the costs of the journalism, then more of the money we get from the readers can be used to hire professional journalists." Mr Wales admitted this is, in a way, a description of the way traditional journalism should be. "I have very traditional old-fashioned views on these kinds of things, I think it is important that journalism be very fact based, very evidence based, very neutral." Jimmy Wales and Larry Sanger launched Wikipedia in 2001 as an open editable online encyclopedia resource. The website is now the fifth most visited in the world, with 500 million unique users a month. Although it is thought to be worth billions of dollars, the website is run on a not-for-profit basis funded entirely from donations from users. But despite its success, Mr Wales denied that Wikipedia was also complicit in the dissemination of fake news because it can be manipulated and edited by the public, saying it has been very safe and resistant to the phenomenon. "That's because the Wikipedia community ... are very passionate about trying to get it right, but also sophisticated in evaluating sources," he said. Mr Wales said it was hard to know for sure whether fake news had, as many commentators claim, been used to manipulate the outcome of the last US Presidential election. But he said it clearly had a significant impact, as there was a lot of voter suppression techniques used, targeting voters to stay at home rather than vote for Hilary Clinton. Mr Wales is in Dublin to speak at an event this evening marking international Internet Day, which aims to promote awareness, knowledge, use and understanding of the internet in Ireland by citizens, businesses and communities. The organisers of the event, the IE Domain Registry, marked the day by calling for the creation of an Internet Policy Forum here. The body would provide a platform for Irish businesses, representative bodies and citizens to discuss and debate the implications of Irish and international internet regulations, IEDR says, as well as the challenges and implementation of enforcement. Such issues might include data protection and the arrival of the EU's General Data Protection Regulation next year, as well as other challenges around cyber-security, online child abuse, and other topics.